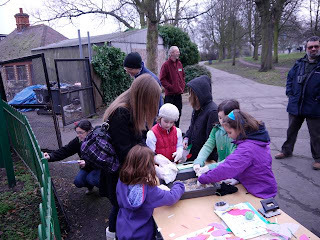 Nearly 30 adults and 19 children attended this year's RSPB Big Birdwatch event on Hilly Fields - a good turn-out considering it was a cloudy and cold Sunday morning. 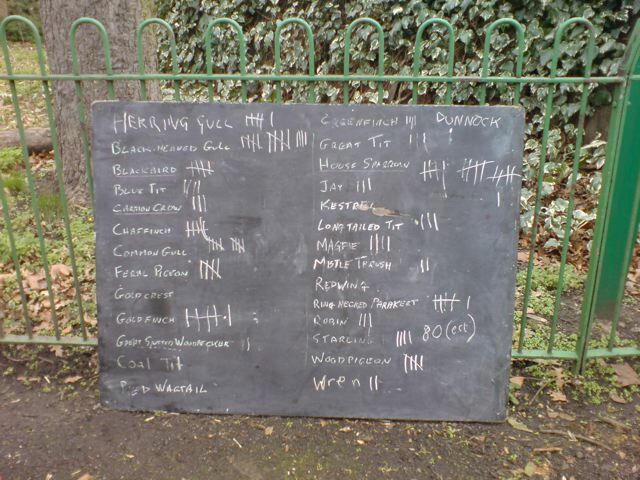 Illustrated sheets of the most common birds were handed out and people set off to scour the park in search of them. Some of the children who came along stayed at base camp (outside the Bothy) to make bird feeders and lard and seed balls with heart-warming enthusiasm. 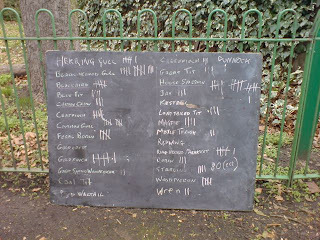 Well done to the person who spotted 5 Herring Gulls flying over the park, but we've checked the RSPB website and "flyovers" cannot be counted. The birds have got to be in the garden or in the park. Sorry but rules is rules! The trouble with birds is that they will fly around and thus double counting - which could mask a decline in bird population levels - is always a risk; hence the other rule about only recording the maximum number of each species that you see at any one time. Many thanks to all who came along. Thanks also to Rachel of the Hilly Fields User Group who organised this event and Judith from Glendale for her assistance. NB. After review of the lists submitted, we added 1 Dunnock and 1 Pied Wagtail to the list above making a grand total of 23 species. Yes, it's the annual RSPB Birdwatch this weekend. 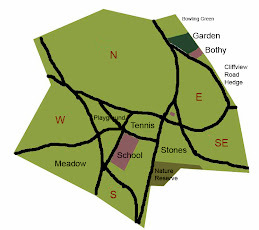 We will be leading walkabouts on Hilly Fields to identify and count the birds we see. The stats will be sent to the RSPB and will also be input to BirdTrack, a database used to monitor bird population levels nationwide. So come along on Sunday 29 January and help. Don't be shy - we are not experts, just enthusiasts and anyone with an interest in birds can join in. Please bring binoculars if you can. If you want to do a bird count in your own garden as well, you can download a form from: http://www.rspb.org.uk/birdwatch/ But remember the RSPB's golden rule: "We need the highest number that you see at any one time, otherwise you may be counting the same bird twice".